The objective of this conference was, with help from real examples from local entrepreneurs, an intensive 1 day session, to sensitise local stake-holders on the ‘state-of-the-art’ of remanufacturing. With a belief that to start proposing a ‘minimum viable project’, or ‘minimum viable team’ to develop Remanufacturing in the region, there is a need for a ‘minimum viable shared understanding’ of the subject, between the stake-holders. Part 1 was an explanation of the current linear value chain, described using local examples from the Basque Country, presented by Tom; followed by Part 2 which showed how the Basque Country is already developing, since some time, some parts of the circular economy. Part 3, presented by Régis, described the technical and circular process of remanufacturing within the circular economy; including key strategies, such as the reverse logistic chain, partnerships with 3rd parties, and design for remanufacturing. Part 4, was local case studies, presented by the entrepreneurs themselves (see links below); which clearly showed what can be achieved locally with plenty of will, hard work, and vision. Part 5, Tom then described the theoretical business model framework, used by companies for remanufacture, and Régis presented International case studies of companies already integrating remanufacturing into their businesses, to clearly present the business models in real contexts; showing also potential hurdles, and how they over-come them. At the end, in Part 6, Tom described the benefits of Remanufacturing Ecosystem Development at a regional level, and how the mix of actions from different actors within the economy, such as political and educational and technical/knowledge institutions, social groups, and companies can help catalyse a stronger strategy for the region. As a summary, we shared that there is much value lost in the current value chain, and much can be gained from recapturing this value from end-of-life products, developing local partnerships, and new business models; with a goal to create jobs, economic value and reduce the linear value chains’ current impact on the environment. 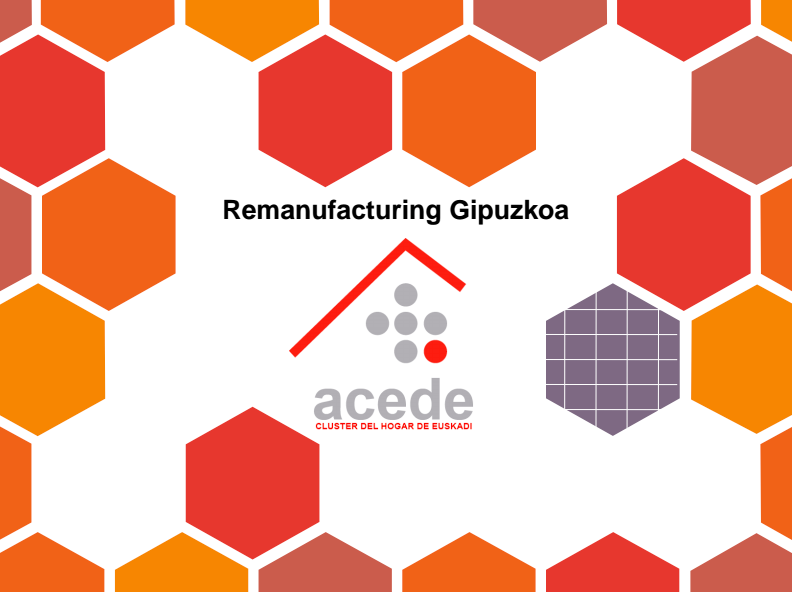 It was made possible by ACEDE and H-ENEA that managed to get many of the stake-holders together in one place. 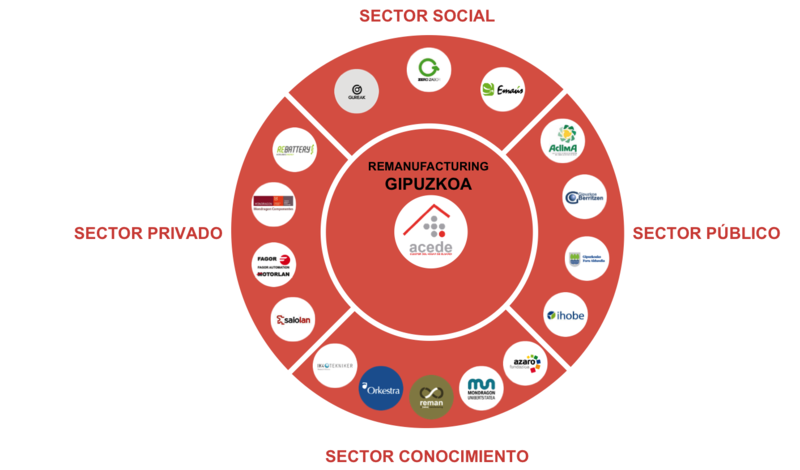 This event is the first step of a project named "REMANufacturing Gipuzkoa", aiming to attract industries and organisations in a consortium represented by "The Four Wings" of Remanufacturing, including the private sector, the public sector, the social sector and the support entities sector (see scheme below). 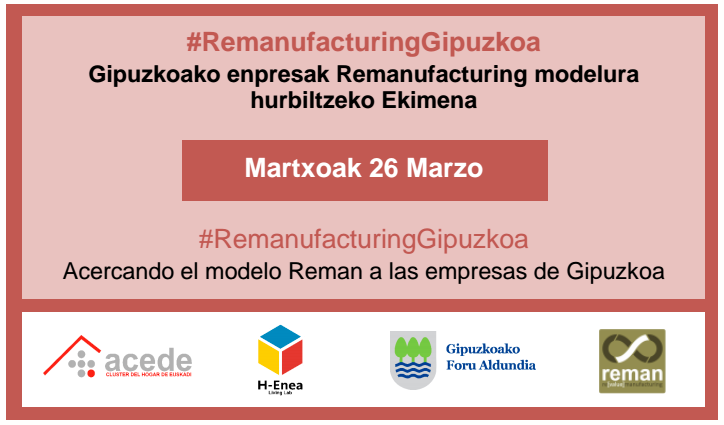 This phase will have the objective to select a case study to develop with the stakeholders that will becomre the references in Remanufacturing in the Region, and will support and be examples to the next projects.